I love board games. You can learn so much as you play and have fun. When my children were younger, we spent most of their formal schooling time playing games. Maths especially was a lot of card games. 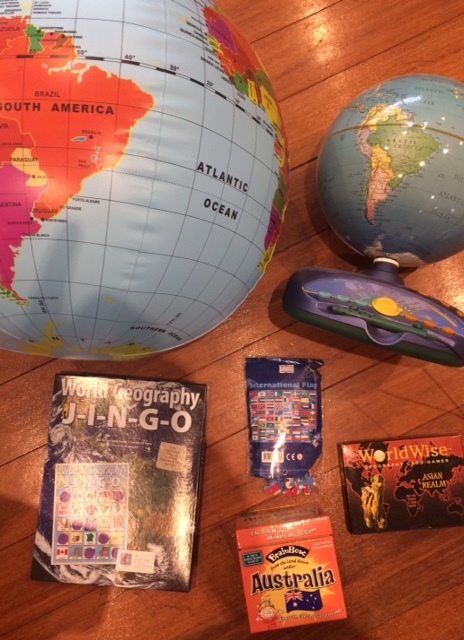 In the last few years, most of our geography learning has taken place around board games, card games, jigsaws, or globe activities. Not only that, but as a family, we love playing board games. Strategic thinking, co-operation, learning how to lose gracefully, patience, problem solving, taking turns etc are all traits that can be learnt through playing games. 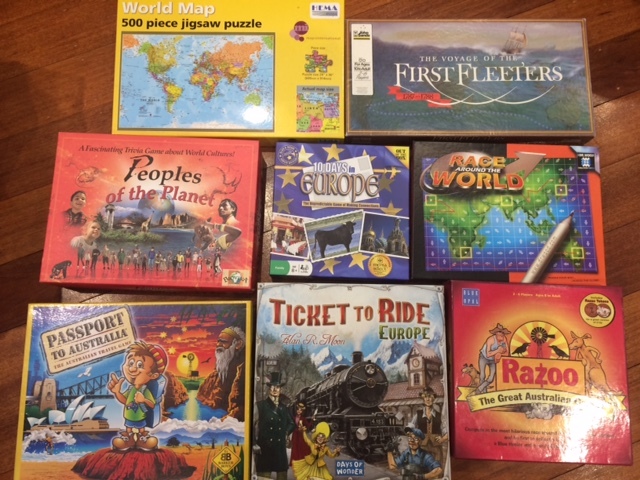 With Christmas coming up in a couple of weeks, I have had a number of requests from blog readers for suggestions for board games. Each birthday and Christmas, I love to gift each child and our family as a whole a board or card game. I have included a photo here of some of our geography games that we play. Our favourite would be ‘Ticket to Ride’. We have both the US Edition and the Europe edition, along with the Asian tack-on. ‘10 Days in Europe’ is also a favourite but hard to obtain at the moment. I have been trying to source ‘10 Days in Africa’ and ‘10 Days in Asia with no success’. Worldwise is a great snappy card game where you need to know your countries and which countries they are located near. Passport to Australia has also been popular with our family. We have also used an inflatable globe for fun active games involving questioning each other where countries are located. The electronic globe has been a favourite with the kids using it to improve their knowledge and beat their own records. Jigsaw puzzles are also great for co-ordination, spatial awareness, and learning. We recently bought a $2 flags of the world jigsaw puzzle which was a fun way of looking at various interesting flags. Our children have entered the Australian Geography Competition for year 8’s and have won prizes even though they are a lot younger. Princess came equal second in Australia when she was in year 5. I am sure that her knowledge of various countries and where they were from all the games we played, helped tremendously. I cannot encourage you highly enough to invest in board games and play them as a family. Soon you will have friends playing them too when they visit. We have a large number of board games that aren’t geography based but I chose today to concentrate on geography based games. These games include Sorry, Monopoly, Squatter, Sea Battle, Lego Games, 5 Second Rule, Cluedo, Word on the Street, Boggle, Twister, Pictureka, Guess Who, Upwords, Pick up sticks, Rush Hour etc. Favourite card games include Cranium, Razoo, Billionaire, Phase 10, Quiddler, Pirates Loot, Rummikub and Sleeping Beauty. Games I would recommend if your children are very young eg under 6 years of age, are Snap, Fish, Memory, Twister, Sorry, (Luedo is similar), Guess Who, Sleeping Beauty, Cluedo, Lego games, dice games, Boggle, Pictureka, Pick up sticks, pack of cards, Sea Battle, Razoo, Race the World, Rummikub and Jigsaw puzzles. Several months ago, we were travelling the other side of the city where there was a game shop. (Our local games shop has closed down.) I had half an hour to find and buy some for family Christmas presents. Below are the new ones we haven’t tried yet but will be under the tree this year. Plus, I have ordered some Professor Noggins card games (countries of the world, More countries of the World), Worldwise Americas, and Scrambled States of America game Deluxe Edition as our knowledge of US States is very poor. The games below are not geography based but looked interesting. 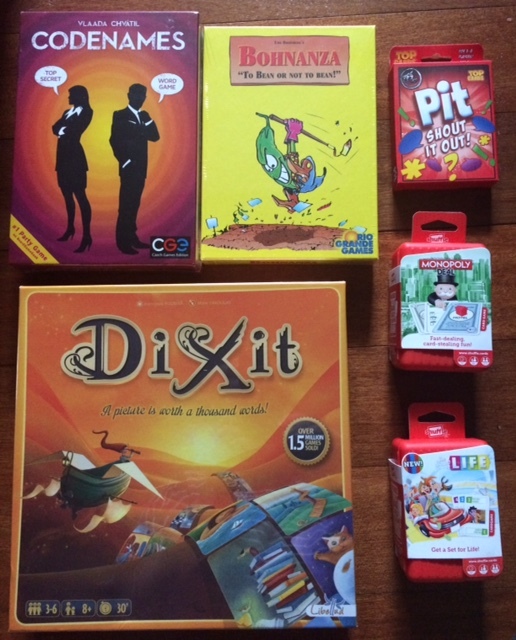 I have given a brief spiel about each one as I love it when I find a new board game or card game that I haven’t heard of before. ‘Codenames’ – The 2 rival spymasters know the secret identities of 25 agents. Their teammates know the agents only by their codenames. The teams compete to see who can make contact with all of their agents first. Spymasters give one word clues that can point to multiple words on the board. Their teammates try to guess words of the right colour while avoiding those that belong to the opposing team. And there is an assassin that you must avoid. ‘Bohnanza’ – a game of strategy. Age 13+ for 2-7 players. You have 2 or 3 bean fields and a handful of bean cards to plant in those fields. When you sell the beans, you earn more for growing more of one variety than a few of several. Thus, you want to plant as many of your favourite bean as you can but you must plant the beans in your hand in the order you got them. To get rid of the beans you don’t want to plant, you can trade them to other players. ‘Pit’ – shout it out. Shout out your deal and swap your cards to collect a set. Be the first to grab a complete set and hit the pit to win the game. Seems a quick fun noisy game. ‘Monopoly Deal’ – apparently a lot more fun and much quicker (around 20 minutes per game) than the board game. Monopoly is a huge favourite with the kids but always seems to elicit a groan from the adults when suggested. I am hoping this card game may become a favourite. ‘Game of Life’ card game – this is a newer version as we lost our old version and apparently not as much fun. You have to play all your career cards and collect your life points. ‘Dixit’ – a picture is worth a thousand words. On your turn as the storyteller, choose a card from your hand and give a clue for it. The other players choose one of their cards that best fit your clue. Shuffle and reveal all the chosen cards. All players secretly guess which card is yours. Please feel free to comment in the section below with board and card games that you and your family love playing. I love hearing of new games that we haven’t tried yet but which other families enjoy playing. Your suggestions may well appear on next year’s birthday and Christmas lists! We have 10 days in Asia which we don’t play. Your welcome to it. Thank you so much Nat. We would love it. Are you coming to Melbourne for Christmas?